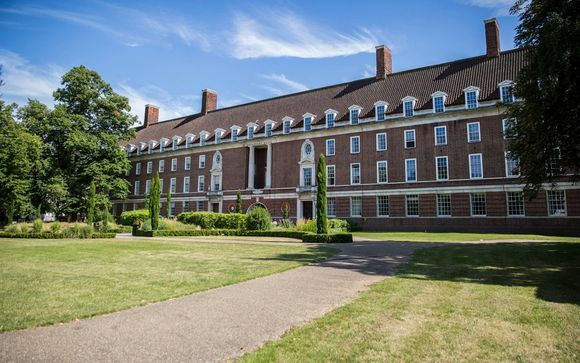 Your hotel is located within the Old Royal's College's so you are just steps from London's signature grandeur! This royal borough is a breath of fresh air within easy reach of the centre of London. Perhaps the most iconic part is the Old Royal Naval College whose elaborate English Baroque style and large green plain provide a stark contrast to Canary Wharf's glass jungle just across the river. As you roam its cobbled streets, you will encounter Victorian-esque junk shops, innovative delicatessens and pokey pubs...it hardly feels like London! 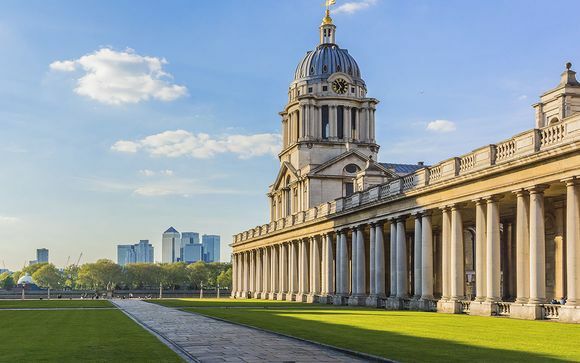 Some other Greenwich highlights that are on your door step include Greenwich Market, a characterful 18th century pub & Greenwich Park where you will also find the world famous Greenwich Observatory. London's mix of grandeur, history, style and culture is just a few stops away. This city charms with leafy Royal parks, free world-class art galleries and frothy ale amid wood-clad pubs; it intrigues with ancient streets and grand architecture, and excites with the neon-lit West End, designer shopping and an innovative dining scene that has become one of the richest in the world. When your 18th century hotel is housed within a UNESCO World Heritage Site you know your stay is going to be a memorable one. This red-bricked Georgian building is steeped in maritime history, its tall white columns and elegant carvings have a story to tell: one that goes hand-in-hand with Britain's extensive naval past. Inside & out, you will find a wealth of original features alongside modern style, combining to create an inspiring setting. Outside the maritime history continues with the pretty hotel gardens featuring a small cemetery where Admiral Hardy, flag captain to Admiral Lord Nelson is buried; whilst the National Maritime Museums and gardens are found directly next door and the Cutty Sark just minutes’ walk away. This hotel combined original characteristics such as over-sized sash windows with modern comforts to create a peaceful space for you to unwind. - Double / Twin Room (12m² / max. 2 persons): These sun-drenched rooms are the perfect spot to relax amidst a modern decor. - Superior Room (15m² / max. 2 persons): These rooms have all the charms of a Guest Room with more space for you to unwind. 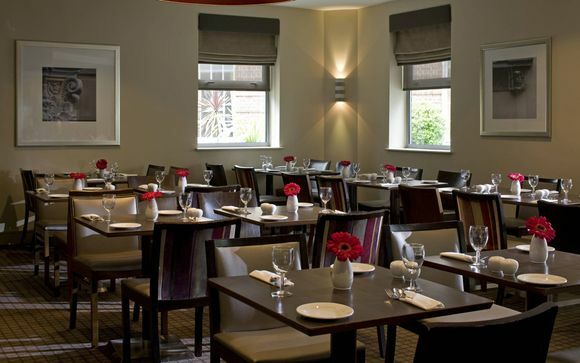 Greenwich Gallery Restaurant & Officers Mess Bar are decorated in keeping with your hotel's nautical location. The seasonal menu has been carefully curated with lots of nods to the hotel's rich heritage, while the more informal Mess Bar specialises in hearty pub classics! Breakfast is served daily in the Greenwich Galley Restaurant and an in-room dining menu is available with a selection of dishes available 24/7. Your hotel is approximately 15min / 1km from Greenwich Station which is on the DLR Line with direct access to both Bank & Stratford, from here the rest of London is easily accessible. Your hotel is not in the congestion zone, however if you were to drive through this area you will be charged a daily fee of £11.50 while travelling between 7am - 6pm Monday - Friday. Please click here for further details.